Village Renaissance Faire - Times Publishing Newspapers, Inc.
After 20 years, still one of the county’s greatest secrets despite drawing 9,000 annually, the Village Renaissance Faire brings history, the arts, and literature to life for one weekend every September for the benefit of the Village Library of Wrightstown. Now recognized as one of best weekend faires around, you too can be part of the magic as an attendee, sponsor, performer, or volunteer this September 14th and 15th on the donated Middletown Grange Fairgrounds in Wrightstown. Faire Director Ken Hone, now volunteering for his 20th year, proudly boasts that the faire has remained affordable to all even as it gained regional recognition and added featured acts. For less than a movie ticket, faire goers encounter jousting knights, dangling aerialists, and flying birds of prey. Shows and activities cover a range of ages and interests on their nine stages and faireways. Performers bring literature to life throughout the day with shows and fairground encounters based on a new storyline each year. Danger shows feature a working trebuchet, living chess, archery matches, and fire breathers. For the music lover, there are dancers, musicians, and madrigals at every turn. While the wee ones are preoccupied with free children’s crafts, a kid’s kingdom, and children’s shows, there are plenty of fine artisans featuring clothing, jewelry, pottery, and giftware to browse. Visiting historians are treated to their large living history square and working artisans featuring blacksmithy, woodworking and glassworking. The fun for all is not yet over, as all ages can enjoy their medieval gaming glen, thrown weapons, Fight-a-Knight booth, pony and carriage rides, a royal petting zoo, and so much more. When the need for a rest overtakes guests, they can enjoy a festive turkey leg, while listening to music at the covered lyrical stage or gazing upon the annual heraldry display. From the welcome one receives from village players at the opening of the gate, to all of the activities and shows, an enjoyable day is sure to be had. And BEST OF ALL, ALL proceeds benefit the public library! The Faire adds new sponsors, volunteers, community groups, and even new Village Player guilds each year, so become part of the family. 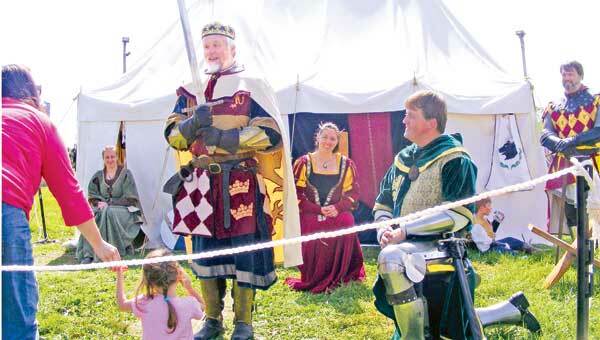 The Faire wants new participants and leaders to help us enter our third decade of greatness. Do you want to help it continue and grow to be 21 and beyond, call 267-304-8060, e-mailing thedefenders@hotmail.com, or visiting www.villagefaire.org. PHOTO CAP: King Arthur (with Sword), portrayed by David Bronovicki, founder of Period Productions, at the Village Renaissance Faire.